Brightsides Designs Giveaway - Simple Art for Rad People! Who's ready for a giveaway!? It's been a while. I'm really excited about today's giveaway from Brightsides Designs by my friend Amelia! I have gabbed all about Amelia's unique prints before, but it wasn't until emails started pouring in from people wanting to know where to find them that I KNEW I had to offer up some of these cute prints to a lucky reader. I have always loved art and everything that goes along with it. It keeps me running! After studying Art & Business in College and not having a clue as to what I wanted to do, I think I've finally found my two passions, Digital Art & Photography. Wanting to develop unique, personalized pieces for my own home, I began designing what i love- sentimental, inspirational & "bright" art. My vision continues to be "distinctive simplicity". Clean lines, bold shapes, and color are my inspirations. After some grateful coaxing from friends, family & the blogging community, I decided to start selling my art. Striving to create a little something for everyone, I have included neutral colors and customization capabilities for most of my pieces, as well as effortless pairing and grouping possibilities to aid in cohesive décor. Thank you for your interest in Brightsides Designs! I hope you enjoy the shop! I'm thinking of blowing it up and putting it behind our front door next to our almost finished hallway nook! 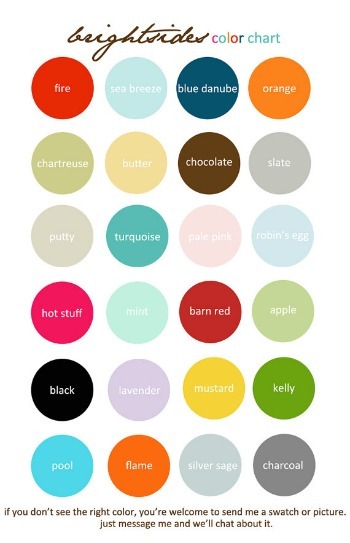 A great thing about Amelia's work is that you can customize your prints to match YOUR homes decor. Simply head over to Brightsides Desings, pick your favorite print and then come back and let me know which you would like to have in your home! Like Brightsides Designs on Facebook. Easy peazy! Don't forget to leave an email if you don't have it attached to your profile. I'll announce a winner next week! Ooo, and right now Amelia has a 4x6 $1.25 printable in her shop especially for Valentine's day! Amelia is also offering a discount to House of Smiths readers! I love the That is Home 8x10 slate! It is so cute! I liked Brightsides designs on FB! I so want the print small homes grow tight families...oh my goodness it is perfect for my moms house...they raised 9 kids in a house that was 1500 sq ft!! Her items are wonderful. I love the daily bread picture, it would look good in my soon to be repainted kitchen. I love your blot, thanks for all the inspiration. love that daily bread print. would look perfect in my almost complete kitchen! I love the "Give us this day..." print, an would love to gift the "Our house..." to a friend. Love her stuff! I adore the Friends who drink Diet Coke... LoL! Thank you for the chance to win a fun prize. I can't decide between the small homes grow tight families and the two little hands-praying girl. So cute! curtinfamily07 (at) gmail (dot) com. i like the "that is home" print! I would choose the very very very fine house with 5 kids! In a 16x20 size. Love her stuff! So cute! I love the small homes grow tight family's !! So cute !! I'm following Brightside Designs on Facebook! Oh and I follow The House of Smiths ! I liked Brightsides designs on facebook!! I love the Did you think to pray? print! I like Brightsides Designs on FB! I love the Small Home print (so appropriate for our growing family) and the Daily Bread print! Great work! I love the Small Home print (so appropriate for our growing family) & the Daily Bread one! Awesome work! love love love the daily bread print! It would have to be "did you think to pray?" I say it to my kids all the time! I liked her on FB... thanks for sharing this with us! love the daily bread print! thanks for the giveaway! I love the daily bread print. It'd look great in my dining room! I love the Small Homes print. Her designs are great! 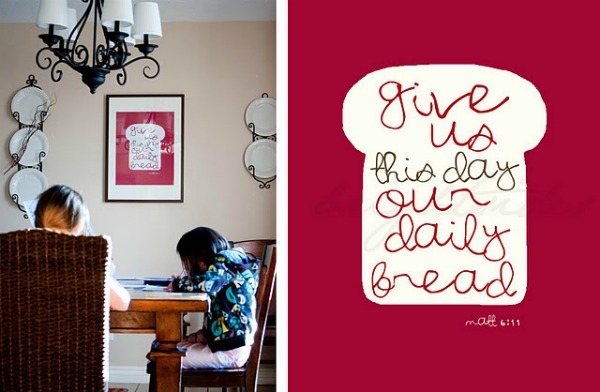 I want the Our Daily Bread print for my kitchen. I really like the "Small Homes Grow Tight Families". So cute! I liked Brightsides Designs on Facebook as well! I love the meet me in the middle print! I love the "small homes grow tight families", really cute colours! Love the "Our House". Updating my family wall collage pics..this would be perfect to center around! Love the "Our House". Updating family wall collage. This would be perfect to center around! I like the Quick to Kneel print. Thanks for the giveaway! I also love the "meet me in the middle" print! I love the diet coke print! Love, love, love the give us this day our daily bread. My fav by far!! I also like the one you are getting but with 2 kids. My email is morgan823@gmail.com. So cute. All of Amelia's designs are wonderful. I love the "our house" design. Also "liked" on facebook. 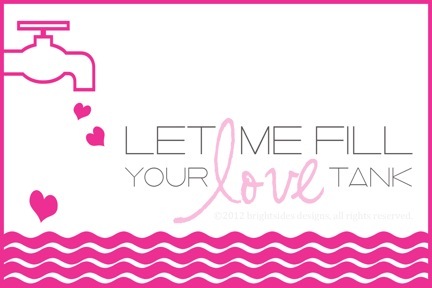 Cute idea to offer the valentine design as a download to create your own card. Will have to remember that myself!! Great graphics ... loved all of Amelia's designs. I think that "our house" is my favourite. Also "liked" on facebook. Thought that the Valentine download to create your own Valentine card was a wonderful idea. Thanks for the chance(s) to win. Love the Our House print! 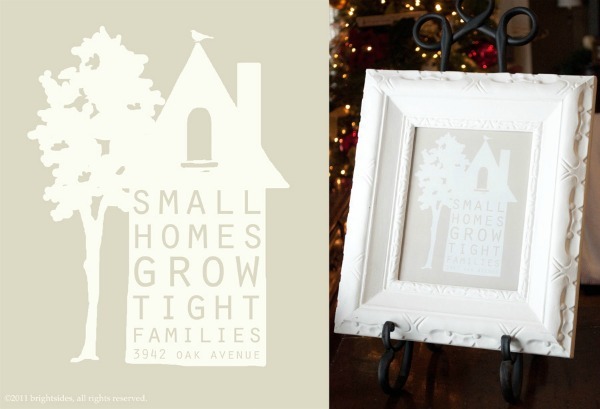 I like the print "small homes grow tight families"
I'm in LOVE with the Small Homes Grow Tight Families print! I'd put it in my entryway! I liked Brightside Designs on FB! Love the Diet Coke print. Love the Daily Bread, Small Homes and Filling of the Love Tank! I love the daily bread 8x10! So cute! I love the Our House print. I Liked Brightsides Designs on Facebook. Gotta have the Diet Coke print - fits me to a tee! I love the daily bread print....something we all should be reminded of. I have the perfect spot in my kitchen for this! I love the Small Homes Grow Tight Families--would look great on my Ballard inspired shelves!! I love the Small Homes Grow Tight Families...would look great on my Ballard inspired shelves!! I love the Small House piece to go in our small house. It was our starter home 13 years ago and we could never leave. We love beign close up and personal. I love the Give us this Day our Daily bread print. And I liked Brightside on facebook! I also love that daily bread print, but the other day when you posted about your girls' Valentine's Day cards, I just had to look at her birth announcements! So cute! Would love to use them for our daughter due any day now. i liked brightsides designs on facebook! 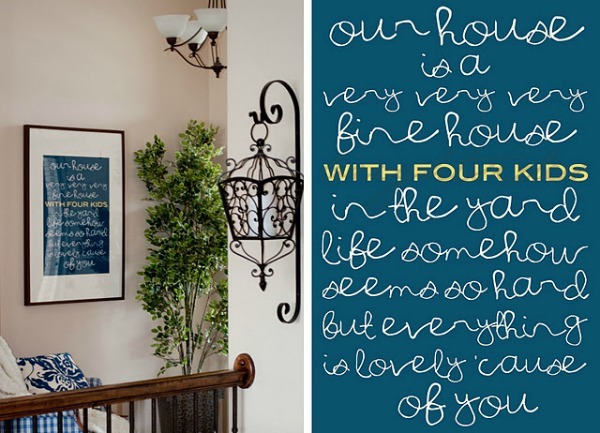 I love the "Our House" print - such a perfect quote! IN I "liked" Brightside Designs on facebook too! I think 'daily bread' is my favorite. I liked Brightside Designs on facebook. I love the small homes grow tight families! Our house is so teeny this fits us! I liked Brightside on fb! I love them all. The Diet COke is so fitting for me. What cute prints. I love the daily bread in bard red! These are so amazing!!! I liked Brightsides on Facebook!!! I LOVE the print about small houses. I live in a small house wtih 2 kids and people ALWAYS ask me why we don't get something bigger. This would be PERFECT for us as we are happy just where we are! LOVE! I love the "That is home" print! I love the small homes print in charcoal. I also liked her on Facebook. These are so simple, which is what I love. Thanks!! I love the Daily Bread print best! I love the Let's Think print!! I love "Did you think to pray" and the light bulb print - SO FUN! Definitely Our House - I love it! I LOVE THEM ALL! I guess my favorite is "did you think to pray" or the one of the little boy kneeling with his hands in prayer. They are all so cute! Love these prints. 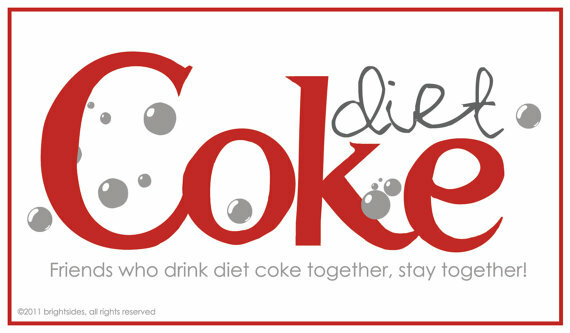 I definitely love the diet Coke posters...as I am an addict. I liked her on facebook....just noticed some other diet coke fans....maybe we should start up a new group. Hey yall...I even posted on Peanut Butter and Diet Coke...my lifeblood. I love the "Let's Think" print! Too cute! I love the "Let's Think" print. Too cute! Our House is my fav...I know exactly where I would put it. Love the "Our House" print! Pretty stuff! I also liked her on facebook. LOVE the meet me in the middle! And small homes grown families! I love the Small Homes print! The Diet Coke sign speaks to me! I love the "small homes grow tight families"....especially since I live in a small condo and we are expecting our first baby! I like the Daily Bread print! It's perfect for my kitchen/dining nook gallery wall! Love "give us this daily bread"....so cute! thanks! I like the Daily Bread print. It would be perfect for my kitchen/dining nook gallery wall! I love the "small homes" and it would look great in my small home. Thanks for offering the fun giveaway. I love the "small homes" and it would look great in my small home. Thanks for offering such a fun giveaway. I like bright sides on fb! 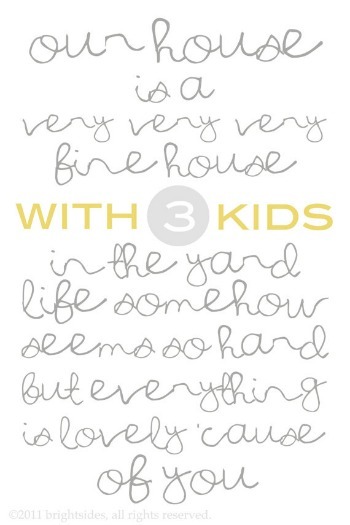 I love the "our house is a very fine house" print because I love that song! Amelia has great art to choose from! She had me at "give us this day our daily bread" Love Amelia's work! I love the meet me in the middle print. Showed her some fbook love! Awesome! I love Small Homes and Our House White. These are GREAT! Thanks for the giveaway! I LOVE the print you ordered and we'll have our 2nd child through adoption by the end of this year. The gray and yellow matches our living room too!! I love the "our house" print. I loved the Meet me in the Middle print! It'd look adorable in my home. 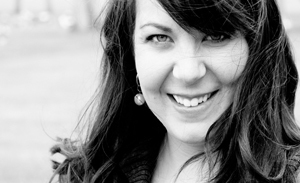 Plus, I liked her page on FB, so hopefully I'll get to see a few more designs she's coming up with! I love the Give Us This Day Our Daily Bread print! My very favorite is the "Small homes grow tight families" =) Hope I win!! Small houme print is wayyy cute!!!!!! I hope I win! I love the "daily bread" print - would be perfect in my dining room! I liked Brightsides on FB! I love the that is home print as well as the daily bread print, I need them for my kitchen! I Liked Bright Side on FB! Love the small homes grow tight families print. Love love love the small homes print. I have had my eye on the "our house in blue" for a while now. I love it! I have had my eye on the "our house" in blue for a while now so I would love to win this! I would LOVE the "small homes grow tight families" print. It would be a perfect addition and precious reminder! Thanks for the fun giveaway...I would LOVE to win!! I just purchased two of her diet coke prints for Christmas gifts. They are darling. I love her did you think to pray and the daily bread print. Darling! I would love the Give us this day our daily bread! They are all awesome though! I would love the give us this day our daily bread print! Love them all! I love the Emily Dickinson quote on "Where Thou art that is home"
I love the Emily Dickinson print "Where Thou art, that is home"!! Love the Let's Think print. Thanks for the giveaway! I have just the spot for the our house print! I absolutely LOVE all of her designs! My favorites are the, give us this day our daily bread and the Diet Coke print. Love the Diet Coke!!! All are very cute!! I like the small homes print! I love the Quick to kneel print! So so great. omg - i would die for "our house"
I Like Brightsides Designs on Facebook. "Liked" on Facebook. Such a fun giveaway. I would love the Small Homes print. I would love the Small Homes print! I love all the prints but my 2 favorites are the give us this day our daily bread and our house! So cute!! I would love the quick to kneel print! I love all of her items but I think my favorite is the Small Homes. Very cute way to personalize my home!! Thanks! LOVE THEM ALL! I love daily bread and small houses grown tight families!!!!!! The Quick to Kneel - 8x10" would be perfect for my family of 5 girls! What a genuine and darling idea. Love her stuff! i like the 'think' print and the 'because i said so' print. I'd love to put the Daily Bread print in my kitchen. So cute! I really like the daily bread picture and how awesome it is that you can change the color!! I also liked Brightsides on Facebook!! I love the "Small houses" print. Perfect for us while we're still renters! I would love to have the quick to kneel print. Great reminder during a busy week! I really like the "Meet me in the Middle" print. My husband just built a mantel type headboard for our room and this would be perfect for it! I had already pinned the "our house" print. I love her style!! I love the "did you think to pray"
lOve the our house in white and the small houses grow tight families...can't decide!!! I can't decide between the small homes make tight families and the meet me in the middle print. sooo cute! I cant decide between the small houses make tight families and the meet me in the middle print. so cute! I love the daily bread print as well as the "quick to kneel" prints! I love the Small House print!! My house is small so this would be perfect on my side table! I love the Small House print...it's perfect for my small house!! I really like the "Meet me in the Middle" print! Fun shop! Quick to kneal is cute!